WHERE TO TASTE THAILAND IN POZNAN? WE GOT ONE, THE BEST PLACE NEAR THE OLD MARKET SQUARE! DISCOVER THE FLAVOURS OF ASIA IN THE NEXT MYTUJEMY CARD, PREPARED ESPECIALLY FOR YOU! Where did it start? Firstly, it was the gastronomy professional school, then technical classes, then studies (the owner of Why Thai graduated from the University of Hotel Management and Gastronomy). Then… an unforgettable trip to Thailand, and after coming back it was all about missing the flavours and willing to share the cuisine of Thailand with Poland & its people. Many years ago the thai food was not so popular in Europe. People was afraid of weird combinations, exotic meals & different aesthetics. Why Thai was created to change that. Thai cuisine in the premium version. For a date, family dinner, lunch, birthdays. As you can see on the pictures – it worked! Why Thai is an unusual place serving thai cuisine – Pad Thai (We wrote about the Royal Pad Thai on MYTUJEMY couple of times), curry, exotic dishes with langoustine or kafir leaves or guinea hen with coconut sauce. However, Why Thai is also desserts (noteworthy are certainly water chestnuts, which you won’t find in another restaurants in Poznan) and specially designed cocktail card. Our favorite drink is Thai Mule based on gin, honey, hop and ginger. 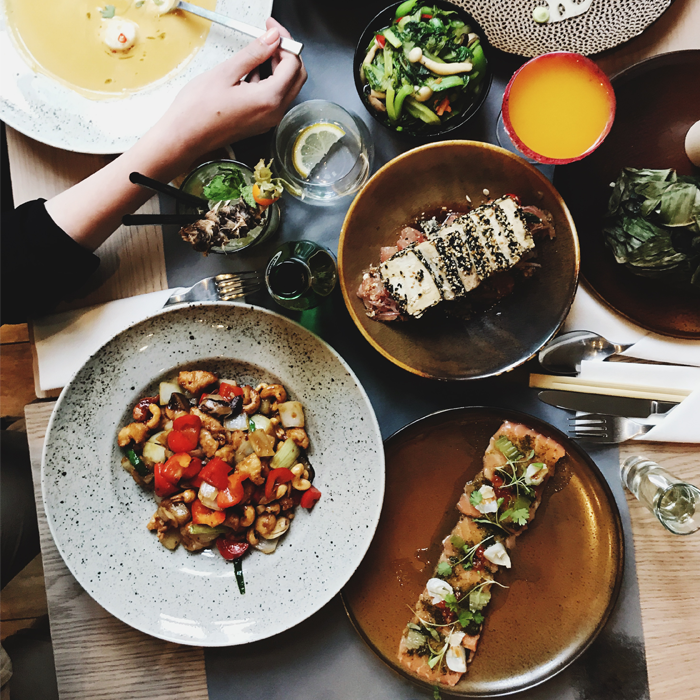 Chef Maciej Bartkowiak is responsible for the taste and everything you see on the plates in Why Thai restaurants – both in Poznan and in Warsaw. Full of aromatic spices, expressive flavors, fresh vegetables and fragrances, Thai cuisine is the perfect idea for a family dinner, meeting rooms with friends and important occasions, such as birthdays. Also businessmen who choose this place for their important business meetings have a very Thai taste. “we believe in energy between people, SO THAT’S WHY A CONTANT WITH OUR CLIENTS IS SO IMPORTANT TO US. WE WANT THEM TO FEEL COMFORTABLE.” – SAYS THE OWNER OF WHY THAI, Michał Niemiec. We agree with these words. We believe that everything we feel being in Why Thai is honesty. Honesty – both in the approach to the client and employee. Because a satisfied employee is the best ambassador of the restaurant, and there are also: guests smile, joy, friendly conversations and general satisfaction. What can be proof that HR is really great here? The fact that the restaurant owner took some workers to Thailand for a cooking school! It is not surprising that Why Thai gained (as one of the few in Poland) the title of Thai Select – awarded by the Embassy of Thailand for the authenticity of taste. It is a big distinction! The whole staff was constantly updated in the area of customer service and wine knowledge. photo: Why Thai materialsWe have a tip for you that will allow you to try even more dishes at Why Thai! If you are a bigger group in this place – ask for serving dishes in the middle of the table with additional plates, and thus everyone will find something for themselves! Spicy flavors, sweet, sour, salty… a real explosion! And a great way to spend time with friends – nothing like the presence of beloved people and the taste of great food! “IF THANKS TO NICE EXPERIENCES OUR GUESTS ARE ALSO SURPRISED BY THE TASTE, WE FEEL FULFILLED” – says Michał Niemiec, the creator of all that thai FUSS. A small warning for those who are fixed on the search for small buddha statues and the heavy smell of incense in Asian restaurants. You won’t find these elements in Why Thai! Fortunately! In well lit rooms, not overwhelming, created with a love for modernity… you can freely focus on the most important – food. We also love the glass kitchen, through which we are looking at chefs preparing thai meals for us! Before going to Why Thai, you must also remember that a European guest can not withstand the level of spicyness of the dishes that is common in Thailand itself. That’s why you’ll enjoy Thai Spicy or Regular Spicy dishes at Why Thai. However, if you like to warm up and feel the tears on your cheeks after really chilli dishes – you can, according to your taste, supplement them with spices that are served by the service right after placing the order. You can also ask the chefs (native Thai!) do go beyond the standards. Are you gonna challenge yourself? Visiting Why Thai is like going to exotic holidays, something different from the every day life. If you’re already in this restaurant – add a social media picture with #mytujemy – we will surely find you! IMPORTANT INFO – TO REMEMBER! Why Thai is always a restaurant in Warsaw. Find more information: here. This article was created thanks to Why Thai. Big thanks for patience & understanding to Maria Karpinska, the manager of Why Thai.